Google Places Review Change: Test or Takeover? If you’ve looked up any business in Google Places today, you’d have noticed two BIG changes to the layout. One change screams at users to write a review through their Google account—and not through a third-party site like Yelp or InsiderPages. 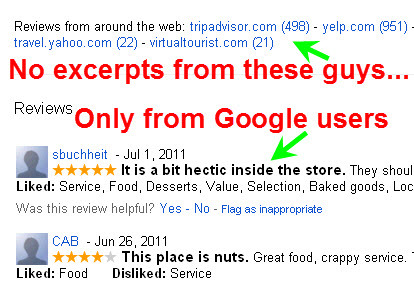 The other change makes the reviews customers have written you through these other sites far less visible on your Google Places page. Both of these buttons were there on the Places page before, but they were far less visible—appearing as small text links rather than as big, visible buttons. It’s always been a little tricky for customers to write a review of a business through their Google accounts—especially if a business owner asks them to write a review but they don’t have a Google account set up yet and have to take the necessary detour to sign up for one. 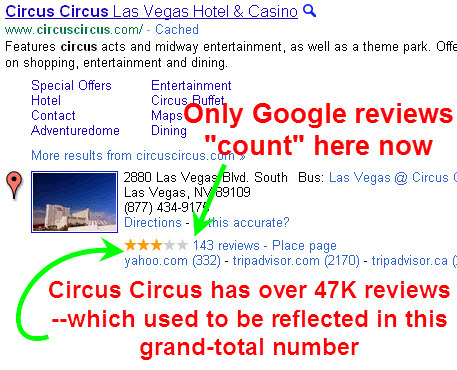 For some time Google has been trying to get more of its users to write reviews. 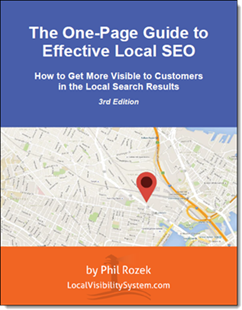 It’s all part of an effort on Google’s part to make the Places Page “one-stop shopping” for customers to learn about local businesses—so that they don’t spend as much time reading reviews on other sites. This is a step in the direction of making Google Places more self-contained, and not reliant on reviews written elsewhere. Gone are the review excerpts from other sites. They don’t show up on your Places page any more. Until today, you could have a total of 8 review excerpts showing up on your Google Places page: a maximum of 2 excerpts written by customers with Google accounts, and another 6 excerpts from reviews written on sites like Yelp, Angie’s List, etc. So Google is showcasing reviews written by Google users, and is paying far less attention to reviews written on sites like Yelp, CitySearch, and many others. All this could be another one of Google’s tests. But if these changes are at least semi-permanent, they represent the latest step in Google’s effort to make itself the “one-stop shop” for information about local businesses—including the customer reviews that used to be the domain of other, non-Google sites. By the way, I just noticed that Mike Blumenthal and Chris Piepho noticed this change a couple of hours ago. Credit to those guys for putting some great thoughts on paper regarding these changes. I could blab on and on about the implications of this change–and I probably will in a subsequent post!—but I’d love to hear your thoughts on this change. Thanks for the update. I noticed it last night while praying that one of our clients business descriptions would update. We have had so many issues with the business description not updating and disappearing. Anway, my concern is that I don’t see the “Details” area anymore. I’ve checked a bunch of Places pages and I’m not seeing it. Details were always at the bottom where you could add in specialty services, parking, organizations, a link to a menu and more. I hope it is not gone! Thank YOU for the update: as I just mentioned in the fairly sloppy post I just dashed off, something else seemed missing, but it was late at night and I just couldn’t put my finger on it. Like you, I was going to go update the “Details” of one of my clients–only to stab at thin air.